Sign contracts to earn money! Inspired by the economy simulation games of the mid 90's. Invest in new buildings to maximize your earnings. 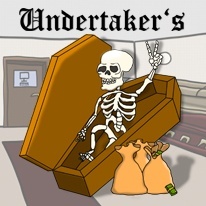 Start as a small businessman and become the biggest undertaker in town. Satisfy your customers to raise your reputation. Had a bad day? Tomorrow will be better! Or not..